Today was supposed to be a 1/2 day of conferences. Note: yesterday was a 1/2 student day with conferences then going from 1pm to 8pm last night - making for a super long day, especially when I get to school at 7am (2 hours prior to the start of school). BUT, we're getting a snow storm right now. Yep - our 2nd one for this season and it isn't even December yet. I am really hoping that having the Halloween storm and now the Thanksgiving storm, mother nature can say she's done with storms. But I completely fear that it's going to be one hell of a winter. Grrrr. OR is this the season where we'll only have holiday storms. I can handle that! Anyway, back to the storm. I got my text this morning telling me that BSD was closed this morning. Yay! BUT, do I have to make up this day in June? Really? It's a 1/2 "teacher" day. Not even a student day. I guess we'll wait to see. I am appreciative of this day right now as the kids and I are going to hang out here, play in the snow, make some Pilgrim Hat cookies (more to come on those - I hope they turn out cute so I can take pics!) , and get ready for Thanksgiving dinner. but I live in the 9-12 range, so I am totally thankful! Yesterday, during conference time, I opted to NOT take a lunch break or a dinner break so I could justify going out of for a run with my other teacher friend. We went out for 4.7 miles, for a time of 38:28 w/ a pace of 8:11. She's a speedy one. Normally that's a good fast run for me when I'm alone and not talking. BUT we talked the whole time. We even talked shop, so it really counts as conference time, right? I would have totally conferenced with any parent who drove by and rolled their window down - or even joined us for the run. Hey, that's an idea! Fruit/Veggies - 1 point (yep - I had a veggie soup and I took in a huge pile of bananas, apples, and clementines and I snacked all day). I could really spend hours upon hours searching online for races to do. I really could. And I am sure many of you do it too. Come on, be honest here. 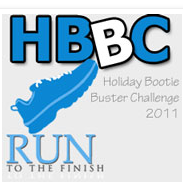 Anyway, I’ve been thinking obsessing about what races I’ll be doing for the 2012 season. Financially it isn’t very smart of me to do every single race I want to do. Right? So I need to really pick and choose my races. The next question is, do I stick with some of the same races I’ve done or do I venture out and try new ones? I’m thinking I have to do a combination of both. There are some races I’ve done in the past that I just love BUT I want to challenge myself too. January: I’d love to do the 4.5 Mile January Thaw again. I haven’t seen it posted yet, but if memory serves me correctly, I think it was late December/early January when it was posted on facebook last year. Let’s just hope for no blizzards the day before. Okay? capped at 800 runners & it is capped off again! February: Midwinter Classic 10-Miler. This is the race that Stacy signed us up for last year and I didn’t want to do it. I thought it was going to be too cold and I was a big baby about it. But as we trained for it through some horrible conditions, I got excited for it – both times. You see, it was postponed from the 1st weekend in February to the last weekend due to a blizzard or some other horrible winter weather and when the 2nd date came around we got hit with another one. The good news is that registration for this year’s race is free! But I did spring for a shirt – bragging rights – to say I ran a 10-mile race in February in Maine is definitely bragging material. Right? *sidenote: and when the race was cancelled, the girls and I still went out and ran our 10 miles that day. We are tough! March: Not sure yet. Something new? Or should I do the Bath 5k again? Maybe I need to plan my own 5k for March. Do I have enough time? 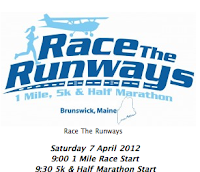 April: Race the Runways ½ Marathon. This will be the 2nd year and let’s all hope (and pray) that we don’t get another blizzard the day before. 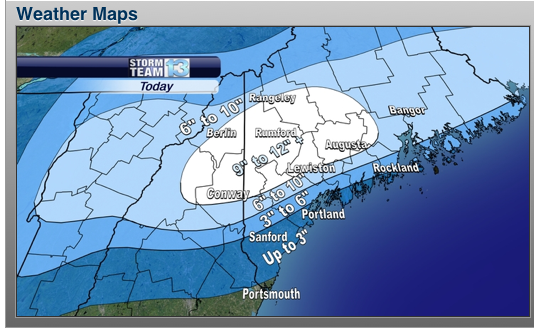 Last year, the race was on April 2nd and sure enough, on April 1st, Maine got hit with a mother of a storm. I’m hoping that the April 7th date is late enough and we don’t have snow then, but we live in Maine and you never know. While this next race is not for me, it’s Ward and Wade’s but during April Break, we’ll all be heading to Boston because the guys will be running the Boston Marathon! I cannot wait. May: This is the most exciting so far – Reach the Beach 200 mile relay. I’ve joined Sarah’s team and a bunch of the girls have joined too. It’s going to be a freakin’ blast! June: KRRT ½ Marathon. Great race and on the rail trail that we love so much. Why not? July: LL Bean 10K, Tri for a Cure (my first tri!) & I’d like to try out the Augusta Trails 5k series. They were hoping to start the series earlier in the summer. I had kid duty for the series this year because Ward wanted to run it and I was training for the marathon. But, this time around, we have a kid duty plan. Let’s hope it works out! 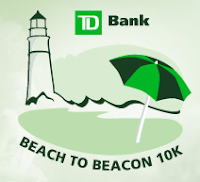 August: Beach to Beacon 10k. I’ll have the registration date on my calendar circled and have the date absolutely cleared. Well, 5 minutes of it anyway because the race will close within 5-8 minutes. That’s craziness. Now, if I don’t get in, there are tons of great races in August to choose from, but I’m not going to think about that right now. September: ??? I did like the Monmouth Apple Fest 5K in 2010. I didn’t do it this year due to soccer with Tucker. I don’t really have to do a race in September, right? Those weekend 5k’s really mess up the marathon weekend long run training plans. But hey, it's only November of 2011, I will probably find some type of race to do. I'm sure of it. October: Support Jill, Stacy, and Carrie at Maine Marathon. I envision (if we don’t have torrential downpours like this year’s race), me riding my bike and giving them water/food/words of encouragement/ taking TONS of pictures. I may even tape a radio to my bike and blast music. Who knows! Then, for Jess & I (if she’s still in) Mount Desert Island Marathon. November: no freakin’ clue – maybe we’ll do our Family 5k again. If this Thursday’s works out. December: Maybe the Jingle Bell 5k – if this year’s one is better than last year’s. Last year’s race was more like a 2.9 race and very poorly organized. Okay, so I ventured out on trying a few new things, but am keeping most of it the same. I can't change it up too much. Are you running new races in 2012? Are you going to challenge yourself in different ways? Or do you enjoy sticking to the same schedule? What about decimal points in the HBBC? Yes on the decimal points in the HBBC, I read it somewhere that it's ok.
You have a lot planned! I cannot plan that far ahead. I'm more of a last minute, month or week before kinda girl. I love having plans - keeps me motivated! @ Danielle - can't wait to have you there to cheer me on! We are definitely enjoying the snow day. @Michelle - you are a planner! @ Robin - and I'm jealous of Texas weather! That looks like a lot of snow especially for this early in the year. Your 2012 race calendar is coming along great! I've thrown together mine with several maybes. I'm trying to keep my options open but I will definitely be running some new races in 2012 and possibly my first marathon. I don't ever remember having this much snow this early in the year. AND it's still here...no melting going on. Ugh. The tri should be interesting as I am not a very strong swimmer. At least I have time to train!!! The snow is beautiful and I think snow days are a great treat. Enjoy!